With his collection entitled ‘NEPSIS. The last legion’, Florin Dobre wanted us all to break out of our consumerist, conformist shells and to question our own thoughts and motivations in life by putting together a show that perfectly encapsulates who he is as a person-a Romanian menswear designer. Firstly, his colour palette seemed to be typical of AW16 menswear with creams, tans and greys being dominant, however his materials were all manufactured in the Romanian Dorobantul factory- a factory that has unfortunately closed down after being a hub of textile production for 129 years. We can clearly see Florin celebrating his Romanian heritage through floral detailing and bright red stitching which adorns cream fabric, but at the same time these features aren’t used excessively and therefore the collection retains its sense of crisp modernity. 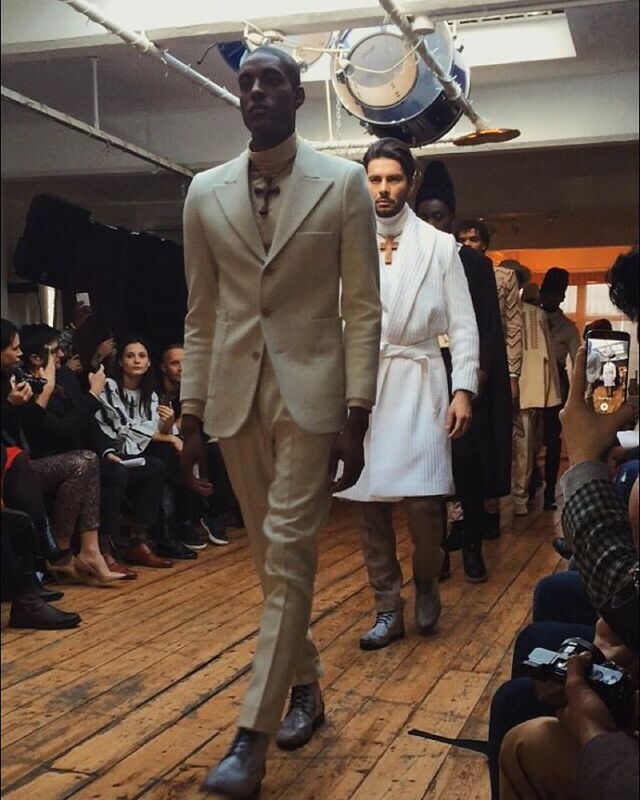 As for silhouettes, Florin strayed from the constraints menswear designers usually impose upon their clothing. Although there were some impeccably tailored suits, he also ventured into looser overcoats, the occasional cape and even some oversized tunics, thereby blending traditional Romanian style lines with the demands of modern menswear. In terms of styling, the most important feature in my opinion would be the wooden cross pendants worn by a select number of the models. Created by Marius, a carpenter who happens to attend the same church as Florin Dobre in Romania, these crosses help embody Romanian culture and its Christian roots and thus helps the collection achieve cohesiveness in a spiritual and organic way. By injecting aspects of his Romanian heritage into modern menswear, Florin Dobre is revolutionising men’s fashion with a unique and personal viewpoint that will prevent his brand from churning out uninventive but mainstream pieces. Be sure to keep your eye on him in future seasons! !